The U.S. Government Printing Office, now known as the Government Publishing Office, has provided printing and dissemination support functions to the U.S. Government for major historical events for nearly 156 years. In 1862 production began on the printing and distribution of President Abraham Lincoln’s Emancipation Proclamation, perhaps the most historically significant job ever undertaken by the GPO. In late 1964 GPO produced the Report of the President’s Commission on the Assassination of President Kennedy, commonly known as the Warren Report. Over that period and into the present, GPO has reflected the changing technologies, techniques, workforce, and standards of the printing industry in general. In order to make its historic resources available to the public, GPO reactivated its history program, with dedicated staff, to serve the agency and outside researchers. The digitization of GPO’s photo collection; and more. 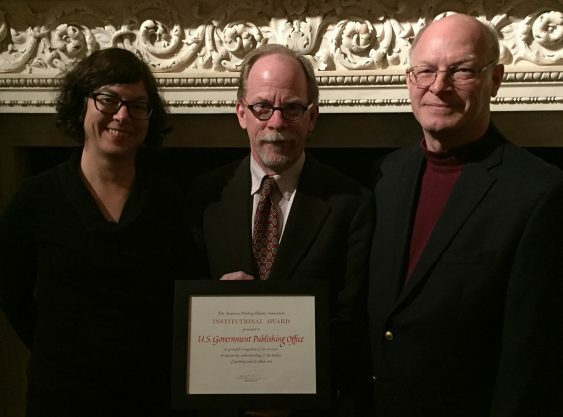 For its efforts in preserving and documenting its history, which reflect the history of the printing industry, as well as making those resources available to the public, I am pleased to present the U.S. Government Publishing Office with the 2017 APHA Institutional award. George Barnum, Agency Historian, will be accepting the award on behalf of GPO Director, Davita-Vance Cooks–please join me in congratulating the GPO! With thanks to the Awards Committee and the Trustees, we’re very pleased and very honored to receive this award, and to find ourselves among the distinguished roll of previous laureates. The Government Publishing Office has had a program for collecting, preserving, recording, and interpreting the history of the agency off and on for about the last 30 years. In 2010, after a few years of there having been no designated agency historian, I was appointed with the immediate task of marking our 150th anniversary in 2011. In preparing these remarks, I looked back over the list of the History Program’s projects of over 30 or so years. I’m pleased to say that it’s a good long list, and that a satisfying amount of it has taken place on my watch, with the inspiration and collaboration of many people, not least my immediate boss Andrew Sherman, and my predecessors James Cameron, Daniel MacGilvray, and Barbara Shaw. We published a new official history in 2011 (and a second, revised edition of it last year), published (this very week) a book of over 200 photographs (and will shortly make that collection available on the internet), created a 2000 sq. ft. ongoing history exhibit that highlights the industrialization of the printing and binding trades in the late 19th and early 20th century, GPO’s prodigious output, and the people who have spent their working lives as part of the GPO family. We preserved a marvelous collection of wood display type that is now used by the students at the Corcoran College/George Washington University. There have also been many smaller projects including a series of bi-weekly lunchtime history talks for the staff (and anybody else who happens to be around). Me : What makes you want to get an MLS? Prospective student : Oh, I just love books. To those folks I generally suggested an application at Barnes and Noble rather than a master’s degree. But in the almost-decade that I’ve been GPO historian, I think I’ve started to understand what my co-workers mean. Government agencies, like many other organizations, are particular, peculiar ecosystems. Their particularity derives from their object of providing a benefit – a service, generally – to people, largely without payment of a fee or much reference to any qualification other than citizenship (and sometimes not even that). GPO is particular and peculiar because it has at its core not only this somewhat abstract duty (embodied in the free and open provision of Government information to the public) but also the very concrete, hands-on mission of an industrial workplace. We actually make stuff. And while what we make has changed radically in the last 20 or 30 years from primarily ink-on-paper documents (which we still produce an awful lot of) to a mix that includes almost every kind of digital information product you can name, the presence of GPO’s mission is always shining through. This combined sense of being in the service of the American people and at the same time part of a long tradition of craft-based industry is in the broadest sense what sparks my co-workers’ involvement, investment, and pride in the Office, which I see demonstrated all the time. And from that, I feel, grows the respect and interest they have for the history of the Office. I’ve been very lucky to have had the time, support, and resources to look rather closely this thing we call (in a kind of shorthand) “the GPO way.” It has roots in a lot of things – apprenticeship, the traditions of the printing and binding trades, patriotism, wartime experience, progressive workplace reforms. The audience outside our walls for what I do is diverse and probably larger than ever owing to the history exhibit being open to the public five days a week (where we see “regular” people who just turn up, scheduled groups, and lots of people who are in the building for appointments). We’ve also found new ways to engage via the internet. I get direct inquiries, we actively use social media, and we constantly find new ways to interact (like the APHA blog, for example). We’ve seen a big increase in the number of inquiries we get from people doing family history, asking us for information about a grandfather/aunt/uncle/cousin who worked at GPO. We clearly have a significant spot in American printing history, and we have been able to engage with that in many new ways during my time as historian. For the people charged with leading the agency, the history program provides information and insight into the place, the workforce, and the culture that can assist in making more nuanced and (we hope) successful decisions. I feel very fortunate that the two agency heads under whom I have been historian, Davita Vance Cooks, the current Director, and her immediate predecessor Bill Boarman, the 26th Public Printer, have believed in that role and valued that insight. For the workforce, regardless of the shade of their collar or the part they play in the operation, it provides context, continuity, and an ongoing connection to that sense of mission that seems to have been part of the fabric of the place since we were created by Congress in 1861. What our history program documents is a rather extraordinary marriage of a big printing and binding works with a Government agency. Interpreting that helps our employees understand their role as part of something that’s more than simply a 40-hour per week obligation. And ultimately the public are beneficiaries of the sense of service and pride in work that comes out of it. My own understanding of GPO’s 156 years is that, owing to that sense of service, there has been a continuing, uninterrupted stream (a river, really) of innovation and adaptation to constantly changing technology, as well as to constantly changing requirements and expectations. It caused us to rise to the challenges of changing economic conditions, world wars, technological revolutions, and yes, political upheaval. It saw us grow to be the largest printing plant on the planet, and has likewise guided us as those numbers of people and machines have decreased while our mission remains unchanged. What is always there is the drive to fill the orders of our Government customers as expeditiously and economically as possible, and to make the product of that work, which has already been paid for by the taxpayer, not only a good piece of work but as broadly and readily available as possible, which we do in a variety of ways, not the least of which is our long partnership with libraries in the Federal Depository Library Program. Without that extra spark, what I look after is only a large file of photographs of industrial machines. It’s my privilege and my joy to document and interpret that particular and peculiar marriage.